Saudi Arabia's King Salman hosted Libyan military strongman Khalifa Haftar for talks in Riyadh on Wednesday, state media said, ahead of next week's Arab League summit. "The king affirmed Saudi Arabia's keenness for security and stability in Libya," the Saudi Press Agency said in a brief statement. It added that the two leaders had reviewed the "latest developments" in the North African country, torn by strife since a NATO-backed uprising in 2011 which ousted and killed longtime ruler Moamer Kadhafi. Haftar's self-styled Libyan National Army backs an administration in the east of Libya that rejects the UN-backed government led by Fayez al-Sarraj. The Riyadh talks come a day before the Saudi king is set to head to Tunis for the annual Arab League summit on Sunday. Libya will be high on the summit's agenda. The United Nations said last week it would organise a conference of key players in April to draw up a "roadmap" to lead Libya towards legislative and presidential elections. 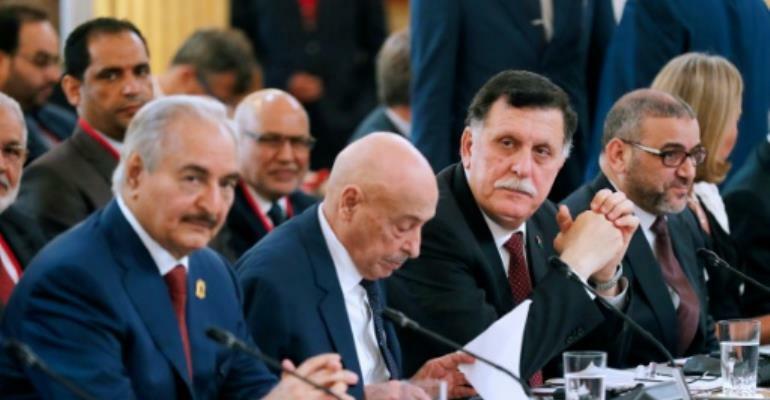 Libya's rival leaders agreed in Paris last year to hold elections before the end of the year, but that vote never materialised as the two rival administrations and numerous militias grapple for power. But the UN has said Haftar and Sarraj agreed at a meeting in Abu Dhabi last month to work towards organising the polls.